Blowout haircut will bring a fresh and relaxed feel to your whole look. With its temp fade on the sides and sufficient length on the top, the hairstyle appears bold and defined. There are many ways to create a blown out by the wind effect with your hairstyle. The best of them we piled up in a solid collection. Enjoy! Everything starts in the head, or maybe on it? If you want to look and feel breezy and relaxed, a blowout haircut is a nice way to accomplish this. It gives an impression of the hair that was blown out from the back by a heavy wind. Of course, there are many various blowout hairstyles out there, the best of which we gathered in our packed collection. So, take the time to choose the style that will make everyone’s mind blow. So, what is a blowout cut actually? If you’ve heard of a temp haircut, then you have your answer, as it’s basically the same thing. To get the cut, you need to have your temple area trimmed short and faded noticeably. The hair on top, in turn, is left longer so that it could be pushed up and styled messy, textured and spiky as if the wind was your hair stylist. It’s not hard to guess that a blowout haircut offers multiple styling alternatives. Even though it may seem that the difference is subtle, this wedge haircut still varies in length, shape, texture and styling. Having that said, let’s get a closer look at our options. Here’s a rather conservative take on the modern blowout haircut. 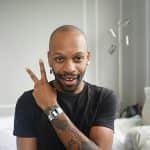 A low temp fade creates a smooth transition from the voluminous top to the luxuriant facial hair while a line-up and a side part add dimension and neatness to the look. 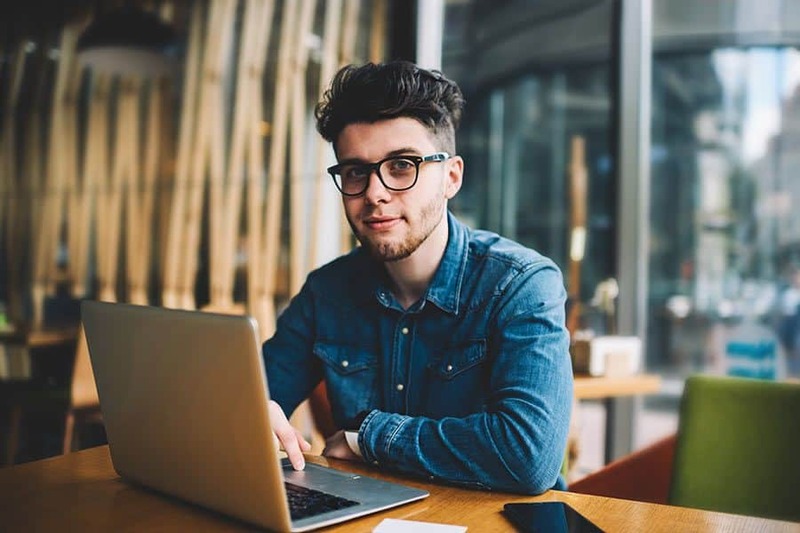 What’s good about short fade haircuts is that you can keep the hair on top as lengthy and ample as you want without looking rough and shaggy. Bangs work perfectly with such a cut. 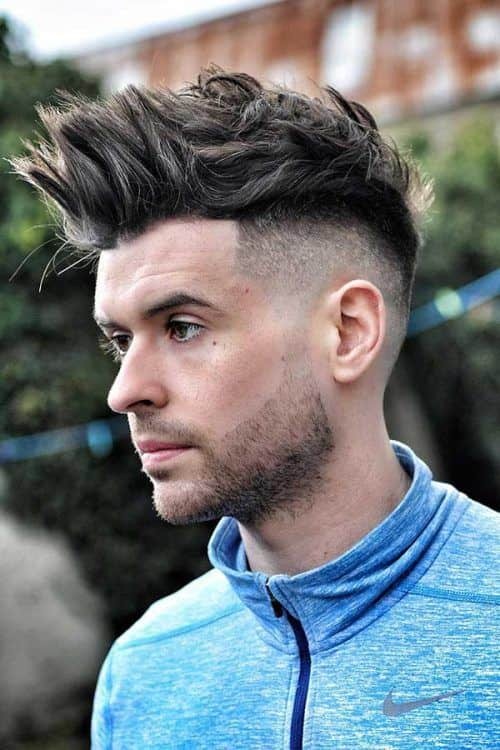 Messy medium haircuts for men are bound to be enhanced with a mid temp fade. With all the tousled locks, they’re perfect at delivering a blowout effect. A cowlick isn’t something to be afraid of. 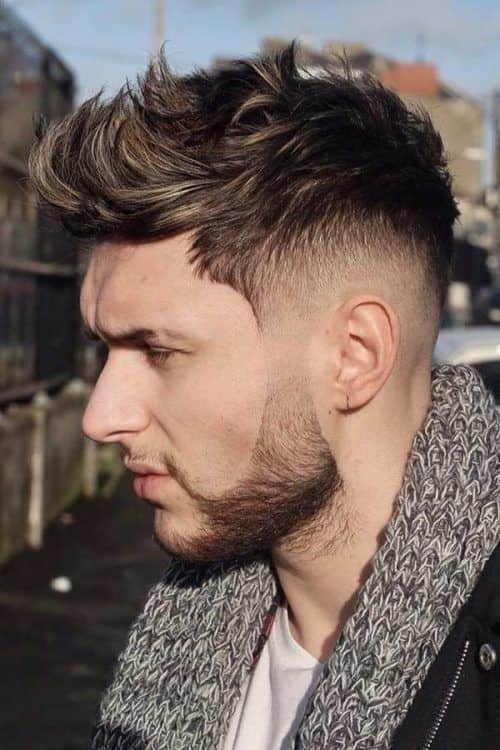 Instead, it gives a unique and creative touch to blowout haircuts for guys. 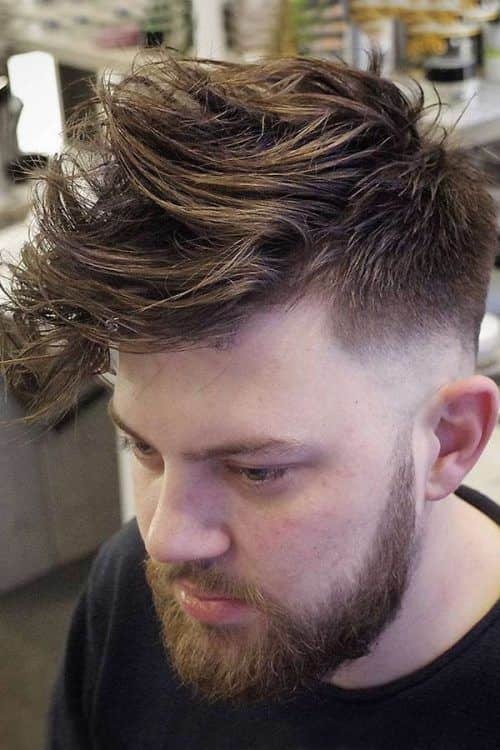 The blowout hairstyle with a quiff is a gold standard of temp fade haircut. Teased up at the forehead, it gives the style a flowing impression. There are many types of haircuts for men with thick and voluptuous hair. A blowout temp fade is definitely one of them. Blowout hair isn’t supposed to always look spiky and messy. Temp fade hairstyles can be adjusted to the formal ambiance as well, and a comb over proves it effortlessly. Straight blowout hairstyles for men require low to zero styling depending on your hair stiffness. Simply push your front section up and secure it with a spritz of hairspray. 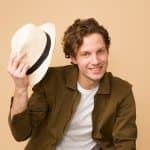 Any list of the best haircuts for men with curly hair includes a blowout haircut by default. With such a bold hair structure, it’s a real crime not to show it off. Another clean and dapper way to style temp fade short hair is to brush it back. You still have a lot of volume and texture but with a more elegant feel. 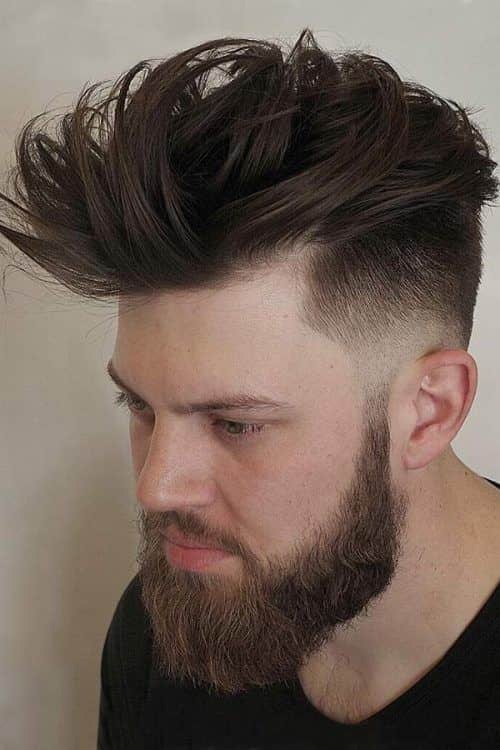 If you wonder how to cut mens hair so that it would come out modern and stylish, go with a blowout haircut with a medium top and high temp fade. The length on top holds the shape without adding any products, which is the preferable way of styling hair nowadays. Blowout mid length hair cut allows you to place emphasis on your hair texture. Simply push the hair back racking your fingers through it with a minimum of styling product to form a naturally flowing wave. 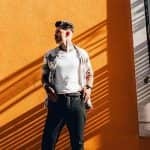 For an elegant and classy look, you’ll need to find a really skillful hair stylist who will give your back and sides an impeccable low fade taper and style the top in textured and blowout waves. 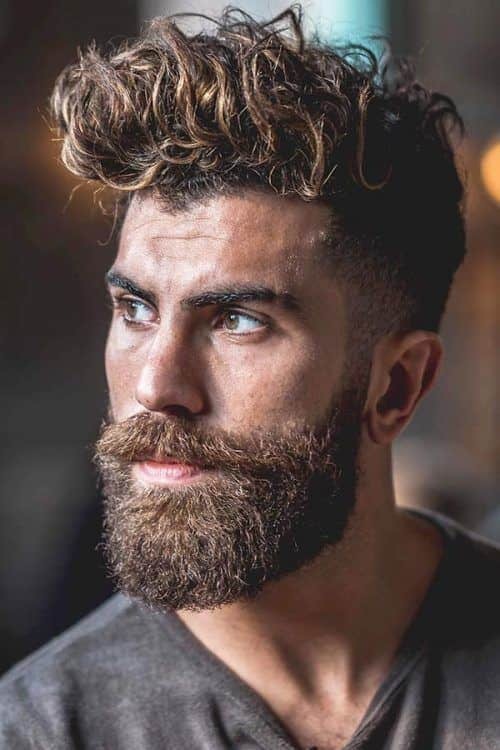 A temp fade blowout haircut is a great option if you’re struggling with frizziness and unkemptness. Just add enough texture to the top and you’re done. Your blowout low fade taper shouldn’t necessarily be of an even length either on top or, obviously, on the sides. Make the front section prominently longer than the back for added boldness. 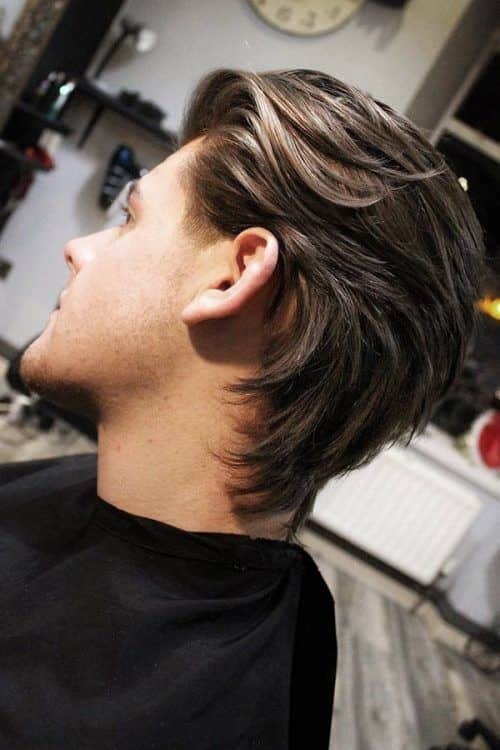 The blowout haircut is still among the trendiest and most requested men hairstyles. With its contrasty and airy look, the appearance of blown out by the wind hair will unlikely ever lose its popularity. Have you already decided what blowout hairstyle you’re going to try out on your next visit to a hair salon?